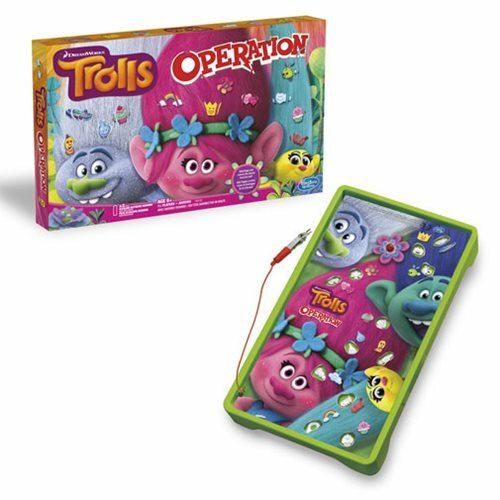 In the Operation Game: DreamWorks Trolls edition, Poppy and her friends have tiny charms stuck in their flowing hair and need help getting them out! Collect the charms from the Troll's colorful hair… but be careful! Touching the sides of the openings with the tweezers will set the buzzer off, and then it's the next player's turn. When all of the charms have been collected, the player with the most charms wins. Includes gameboard and tweezers, 12 plastic charm parts, and instructions. Requires 2x "AA" batteries, not included.